This is crazy. T-Mobile is billing itself as the “UnCarrier” and we even applauded its move to offer 200MB of free data each month, an option that seemed amazing on the surface. After the 200MB was consumed, you then had the option of buying additional data. But it turns out that the “free” data isn’t free at all, it’s $10 per month, which totally goes against the carrier’s entire promise. 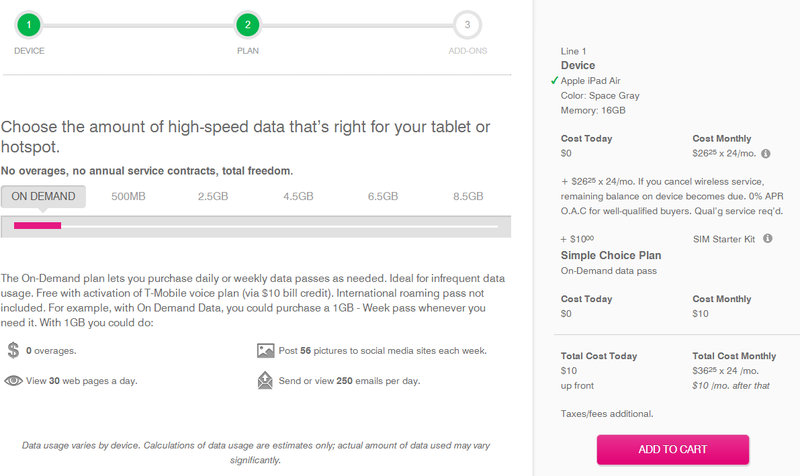 When you navigate through T-Mobile’s site to purchase an iPad (or any tablet, for that matter), and presumably take advantage of the free 200MB of data that’s even advertised on Apple’s site, you actually can’t do so. Instead, you’re forced into a Simple Choice plan that costs $10 per month just to have access to on-demand data. If you read the small print, it suggests that there’s a $10 discount each month if you also have a voice plan, but that’s not what T-Mobile has been telling us all along. The carrier made it quite clear that anyone could walk into T-Mobile with their tablets, or buy a new one, and simply get 200MB of free data each month, no questions asked. CNET confirmed with T-Mobile’s sales team that this is indeed the case. TechnoBuffalo reached out to T-Mobile for comment, but a spokesperson wasn’t immediately available. If this is indeed the case, we certainly feel swindled… and you should too. Let’s hope this gets sorted out. The $10 per mo./fee written about today is incorrect. We had an executional mistake that we will make right. He followed it up with another to make sure things were clear. Yes. Everyone gets the 200MB of free data. No exceptions. No strings attached. We’ll see how this is corrected soon as we imagine T-Mobile will not want to wait to make this issue clearer.